Years ago, Android started off as a mobile operating system that changed the way we experienced mobile devices. Today, it has diversified with multiple purposes including streaming devices. An Android TV box is basically a set-top box that runs on the Android operating system. People use it for watching their favorite streaming channels, such as Netflix, Hulu, and others. Apart from such services you can also use the Android TV boxes, to play Android games and emulator-based ROMs. There are two types of Android TV boxes. One runs the Android TV OS, which comes with an intuitive U.I and a remote or gamepad for controls. The other is a tablet version of Android which requires a mouse for optimum navigation. Though both run the same operating system, you can’t run every single Android App on the set-top version. You can side-load a lot of them, though, but you might not find the experience to be as smooth. Depending on your purpose, you can buy the right device and start using your favorite apps and services. The Leelbox Q4 Max comes with 4 GB RAM, 64 GB ROM, Android 8.1 OS, Quad-Core processor, Bluetooth 4.1 compatibility and 2.4 GHz Wi-Fi connectivity. It also comes with H.265 video decoding technology and supports 4k x 2k up to 60 fps. This allows one to have an efficient and smooth user experience as far as professional image processing ability is concerned. Having the latest Android 8.1 OS also helps a lot in terms of software and app compatibility. 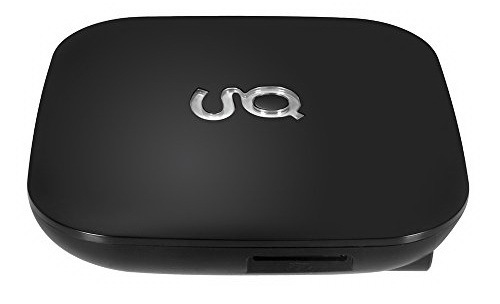 At 3.94 x 3.94 x 1.06 inches, the Leelbox Q4 Max isn’t the smallest Android TV box out there, but it is compact enough to set it up discreetly with your entertainment system. Looks wise it has a traditional box shape which is pretty normal for a TV box. There are very few good-looking products in this category because their main purpose is in functionality rather than appearance. 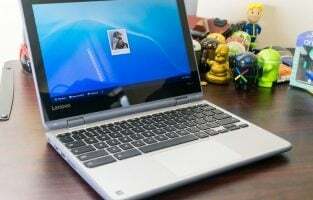 With 4 GB DDR3 RAM, the loading is more fluid than most of its competitors in the same price range. Due to this, you get faster transmission, boot speed, response and channel change speeds which is pretty awesome. By pairing it with a speaker, mouse and keyboard you can have a richer and more fluid viewing experience without moving from your favorite couch. It’s perfect for those looking for an affordable but good performance Android TV boxes. It’s ideal for those who are looking for an easy to set up TV box as the installation is incredibly simple. The Kingbox Android TV box comes with Android 8.1, 2 GB DDR3 RAM, 16 GB ROM, Quad Core, 2.4 GHz Wi-Fi + 5G support and H.265 hardware decoding technology. With Android 8.1 OS you get a smooth and stable experience when it comes to loading images and movies. Moreover, you also get to enjoy better compatibility in terms of the latest apps. The 2.4 GHz/5.0 GHz Wi-Fi along with the 10/100M Ethernet LAN allows you to enjoy a lag free viewing experience when it comes to watching streaming content online. 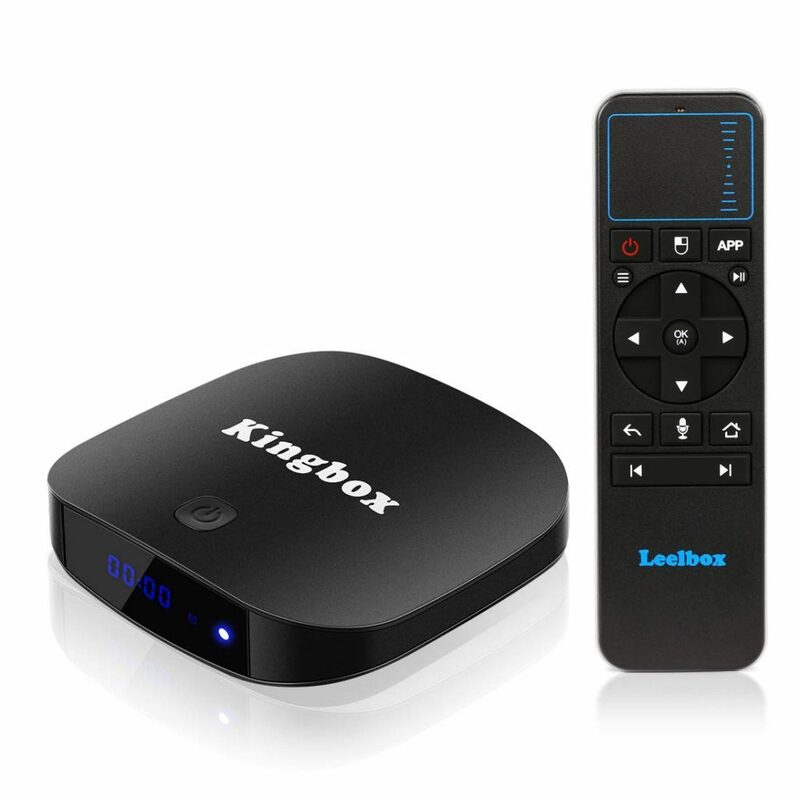 The Kingbox Android TV box is one of the better-looking products in this category. The design is not out of the box, by any means, but it does have a certain classic yet simple look and feel to it. You don’t need to hide it behind your television set like some of the other devices. It is also quite compact with 3.94 x 3.94 x 0.79 inches in size. It comes with a 2.4 GHz voice remote control that has a range of up to 50 feet which is twice the range that you get with a traditional IR remote control. The device supports 3D and 4K resolution allowing you to watch your favorite 3D content at the best quality possible. With the 2 GB DDR3 RAM, you get good performance and a fluid video watching experience too. As far as internal storage is concerned, you have 16 GB EMMC which is quite decent for an Android TV box but you can upgrade it to 32 GB which is even better. The Kingbox Android TV box is ideal for those looking for a cheap TV box that supports Android 8.1. Those looking for the best value, affordable Android TV box for their television set will find this device to be perfect. The Minix Neo U1 comes with Android Lollipop 5.1.1 OS, 2 GB RAM, 16 GB storage, MIMO Dual-Band Wi-Fi (2.4 GHz and 5G) connectivity, 4k support, 60 fps fast response, Kodi compatible and a media-friendly gyroscopic remote control with multi-media playback controls. You can surf the internet flawlessly with the 2.4 GHz and 5G Wi-Fi connectivity and enjoy streaming content with zero buffering time. You can easily watch 1080p content without facing any lag thanks to its 60fps video playback speed. One thing that sets it apart from a few other Android TV boxes is that it is very silent allowing you to have an immersive viewing experience. Size-wise, it is quite compact at 5 x 5 x 0.79 inches and has average looks. However, you don’t buy this product for the looks, but for its performance and features. You can actually save electricity costs using this device as it enters into power saving mode if you don’t use it for a certain amount of time. Another aspect that sets it apart from the rest of its competitors is its external antenna. This is one thing that makes the Minix Neo U1 sort of unappealing to look at but it makes up for it with its amazing wireless connectivity. It’s also incredibly easy to set up and use. The interface is very intuitive allowing anybody to easily navigate the menus and get to where they want to go. The only setback to this device is that it doesn’t stream YouTube and Amazon Prime in HD. Aside from that, it is a great Android TV box for a very affordable price. 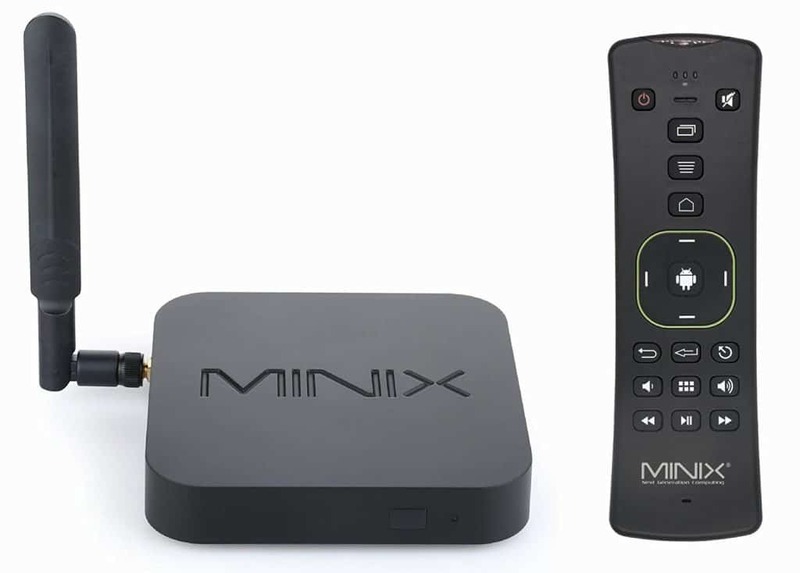 The MINIX NEO U1 is ideal for those looking for a great performing Kodi compatible Android TV box. 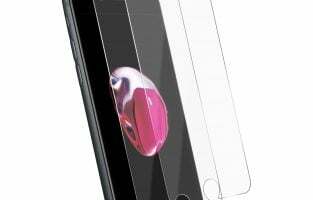 Those looking for a device with great build quality will find this device to be perfect for them. The Roku Ultra comes with a powerful quad-core processor, dual-band wireless connectivity, voice remote with buttons, premium JBL headphones, the Roku Channel and preinstalled apps such as Netflix, Prime, HBO, Showtime etc. You can connect accessories to it, play music and watch videos by using an external drive too. 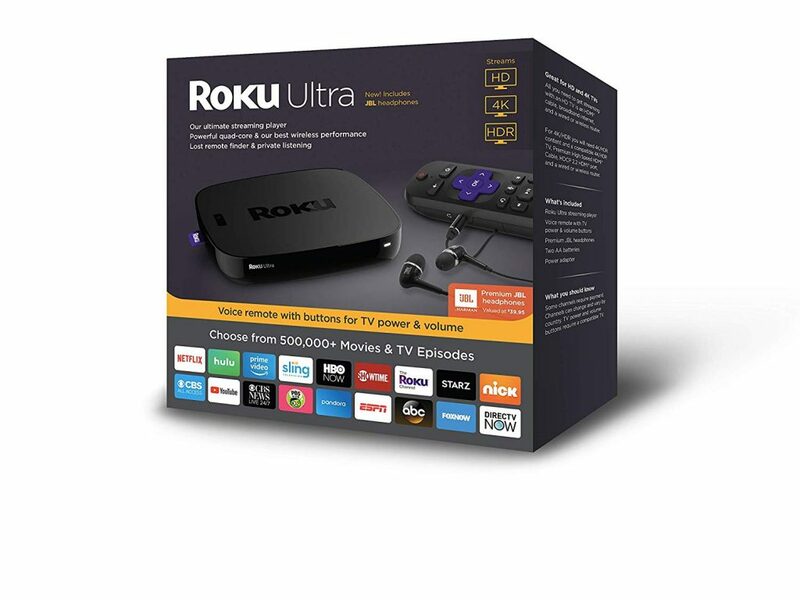 Looks wise, the Roku Ultra is a square box with rounded edges that comes with shiny sides with a matte black top. At 4.9 x 4.9 x 1 inches in dimensions, it is pretty compact making it easy to set up just about anywhere. What makes the Roku Ultra stand apart is its interface which is just brilliant. You can customize the way the apps are placed for better convenience. All you need to do is download your favorite apps and you are good to go. You can’t arrange apps into different folders though. So, it’s better to think about the app layout before you download them. Another unique aspect of the Roku Ultra is that you get a great channel store where you can access numerous apps like Prime, YouTube, Netflix, Hulu, Spotify etc. It also comes with an amazing remote with purple colored direction pads. It not only looks beautiful but also functions extremely well. All in all, it’s a great Android TV box to own. The Roku Ultra has one of the best user interfaces out there for an Android TV box making it perfect for those who like to customize the way they experience their favorite content. 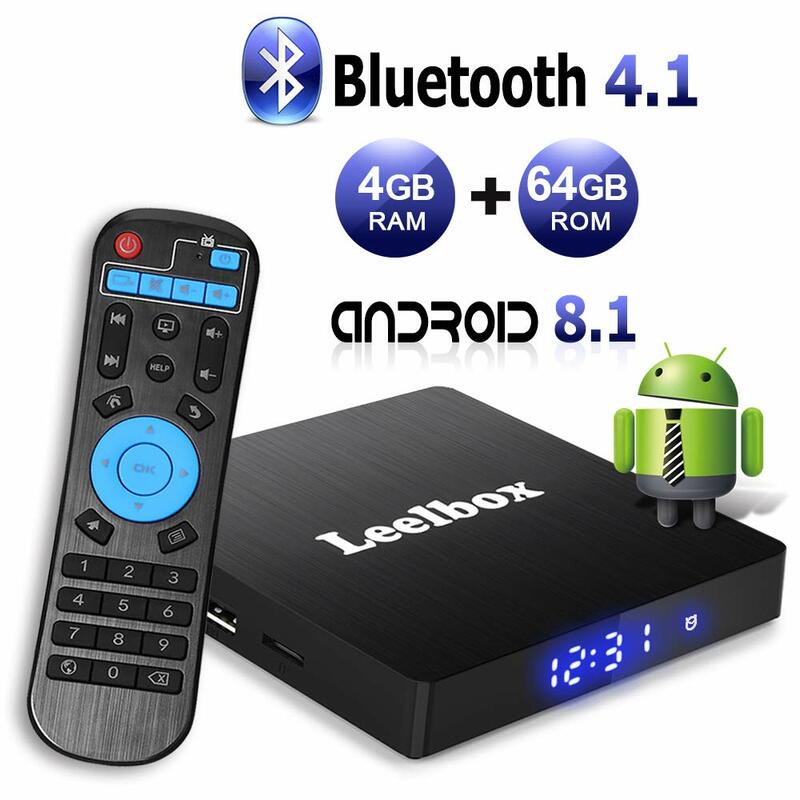 Those looking for numerous free apps bundled into their TV box will find this device to be ideal for them. You also get free JBL headphones which makes it a great buy for those who are looking for extra value in their TV box purchase. The YAGALA T95Z Plus comes with Android 7.1, an Amlogic S912 octa-core processor, 3 GB RAM, 32 GB storage, 2.4 GHz / 5.0 GHz Wi-Fi connectivity, 4k and Bluetooth 4.0 support. For its price point, it comes with incredible power. It also comes with a very attractive IR remote control with LED light and a separate button for Kodi. This allows you to directly access it instantly with a push of a button instead of exploring the menu and clicking on the app. 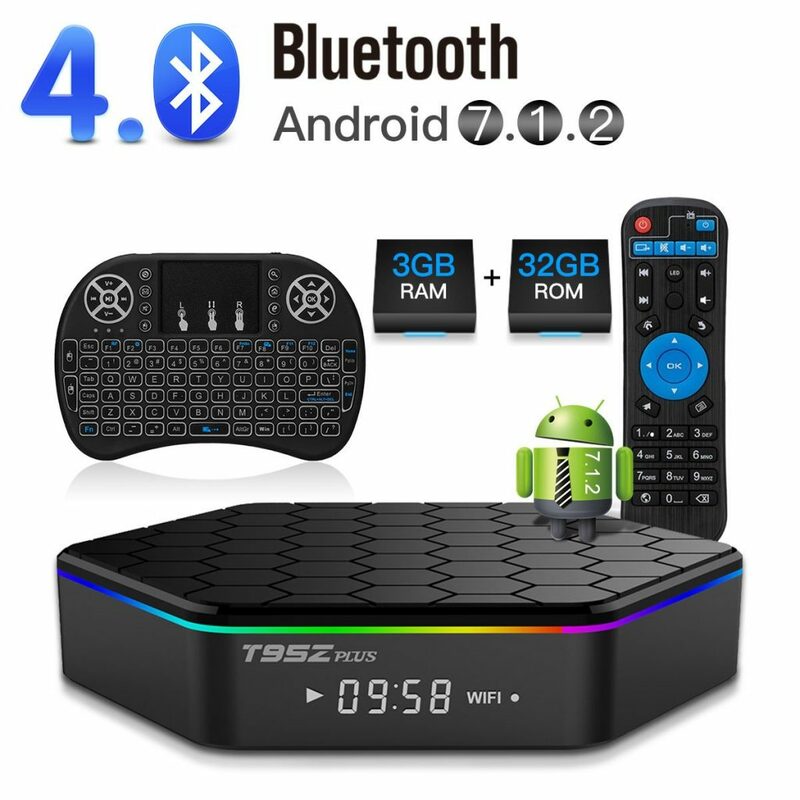 The T95Z is also one of the few amazing looking Android boxes in the market today with its unique hexagonal body and honeycomb pattern on top. It also has LED lights along its sides which look incredible in dimly lit rooms. It also has an LCD screen on the front which displays time, Wi-Fi connection and other important information. The octa-core processor pumps out 1.5 GHz making it one of the best performing Android TV boxes in this price range. 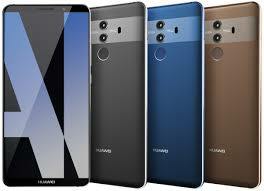 It also has an ARM Mali-T820 MP3 GPU with 750 MHz and 2 GB DDR3 RAM which allows you to run apps efficiently and smoothly with no issues. With 32 GB storage, you have plenty of space to download dozens of your favorite apps, videos and songs. With its 4k support and 60 fps you can stream high-quality content with zero lag. Gaming is also a complete pleasure with this device because of its performance. Those looking for a great looking Android TV box will find this device to be the right one for them. If you love playing games, then the Yagala T95Z is ideal for you due to its incredible performance. 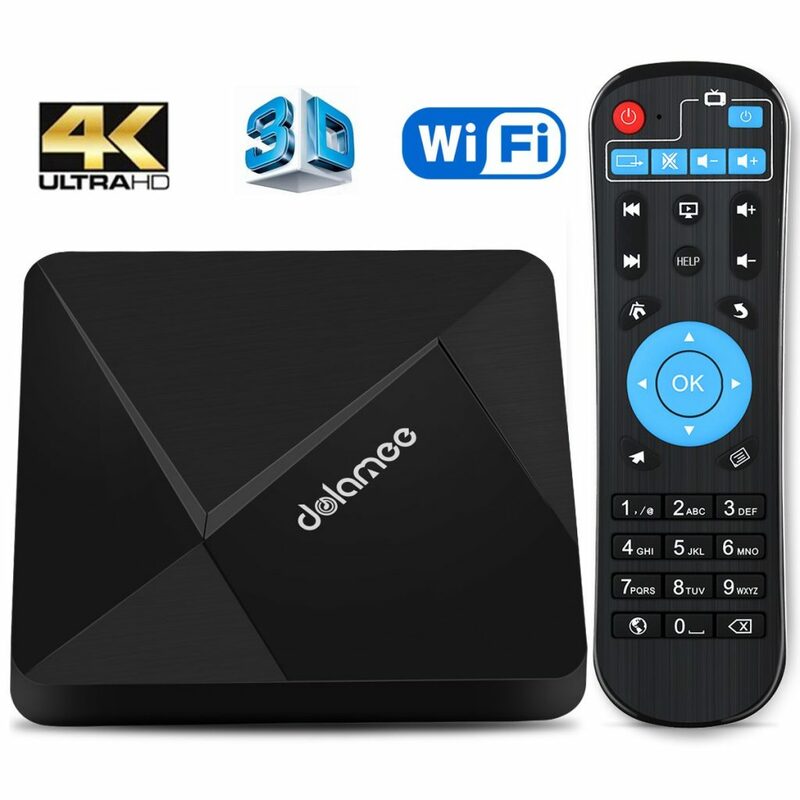 The Dolamee D5 Android TV box comes with Android 7.1, 1 GB DDR3 RAM, 8 GB Storage, 2.4 GHz Wi-Fi connectivity, Amlogic S905 Quad Core processor and external TF card support. It runs on the Android 7.1 Nougat OS making it compatible with numerous apps, software and games to meet any needs you may have. It also supports high definition videos, 3D and 4k content while running them seamlessly. However, you need to subscribe to certain streaming apps when you buy this product due to its low price point. The design is pretty unique with its rounded rectangular shape and an aggressive embossed top with clean edges. Looks wise, it certainly has an edge over its competitors as most of them have very plain exterior shapes. It certainly would look good placed near your HD TV giving your entertainment system a more refined yet stylish visual atmosphere. Performance wise, the Dolamee D5 is quite fast especially when it starts up. The home screen user interface is quite intuitive and easy to navigate. It also has a memory clean app that will help you to free the RAM up whenever you want. In terms of memory, it supports external TF card which can add anywhere from 8 GB to 64 GB allowing you to expand your storage space. What is amazing about this product is how brilliantly it runs games. At this price point, it’s bizarre how powerful it is. Some extremely graphics heavy games would lag for sure but it runs most games very smoothly. If you want a very affordable Android TV box to play games from, then the Dolamee D5 is one of the best options out there. Those who are looking for a great looking Android TV box at a very cheap price will love this device due to its stylishly aggressive looks. 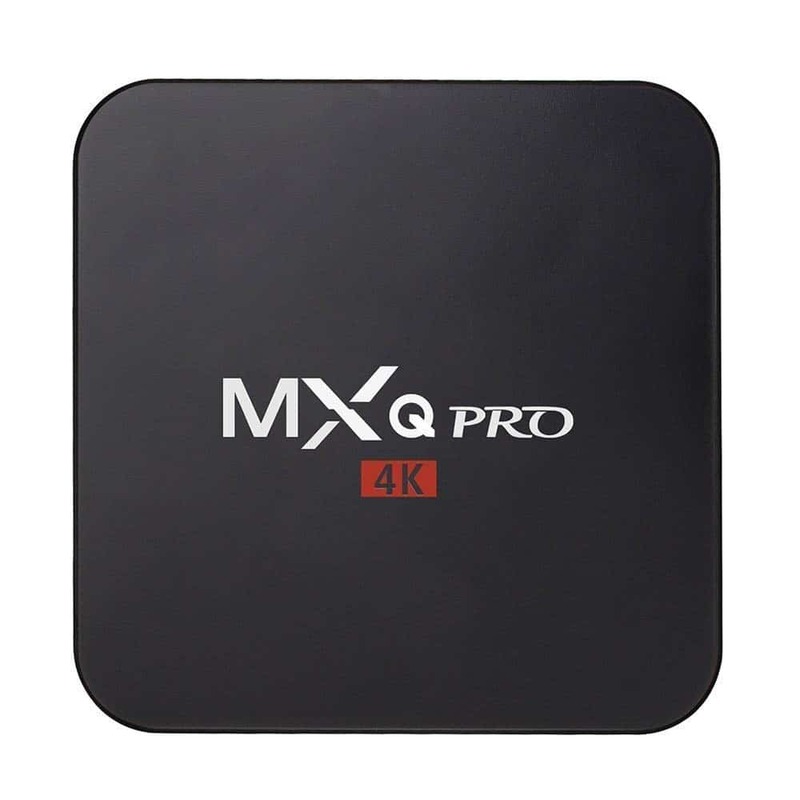 The MXQ Pro is a smart streaming media player that comes with 1 GB RAM, Android 7.1 OS, quad-core AmLogic S905X, 4 USB ports (2.0), 4k compatibility, wireless embedded keyboard and 2.4 Ghz Wi-Fi connectivity. It’s not a well-known brand yet, but it is one of the cheapest options available for an Android TV box today. It’s very compact in size at 5 x 2 x 4 inches and weighs about 13.6 ounces allowing you to discreetly keep the device away from sight. The last thing you need is seeing a black box lodged either on top of or below your TV. It comes with only 1 GB RAM and therefore isn’t powerful enough for gaming purposes. This device is meant for basic streaming purposes and is priced that way. You can also choose to add accessories such as the Back-lit Mini Wireless Keyboard with Touchpad and Multimedia keys for better user experience. With it, you can pretty much navigate and control any service easily and conveniently. All in all, it’s an entry-level product that comes at a very cheap price point, designed for a single purpose, which is watching streaming content. Those looking for a cheap Android TV box will find the Amalen MXQ Pro to be quite ideal. It’s also perfect for those who are looking for only basic streaming purposes. Amazon Fire TV is equipped with an interface that allows you to watch 4K videos in High Definition whenever you want within the comfort of your house. The inbuilt software of Alexa Voice Remote easily allows you to search for your favorite content on more than 190 channels and apps in one go. It is one of the most powerful tools in the device that makes your experience even simpler and more fascinating. It is well equipped with all the latest streaming apps like Netflix, Amazon Prime, YouTube, Hulu and many more. It even lets you have access to websites like Facebook and browsers like Firefox so that everything can be used on one device. You can have access to all your music, books and videos all under one Amazon account in a single place. The Amazon Fire TV promises to give you the best experience when you are watching live events as well. 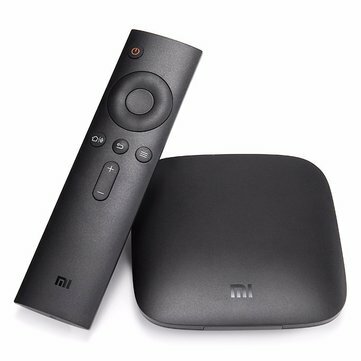 The Xiaomi Mi Box is one of the most interesting contenders that are giving a huge competition to other Android TV Boxes. It allows you to stream 4K videos oh High Definitions and has a great Bluetooth voice remote along with it. Its compact and convenient set up provides an excellent product to the consumers at a very affordable price. Its intriguing design is acclaimed for its international award-winning presence. This device allows you to connect with the world of entertainment while relaxing back at home. All your favorite TV shows, movies, games, and apps all in one place with the most convenient usability structure. It comes pre-installed with popular streaming websites and apps like Netflix, YouTube, Sling TV, Vudu, Fandango NOW and more. You can watch, play and get unlimited, top class entertainment for as long as you wish, with full access to all the hit shows- be it TV series or reality programs, blockbusters, all-time favorite radio stations and all the other videos that are going viral on the web. This device allows you to stream your favorite shows, movies, music and more on your phone, laptop, tablet and your widescreen TV. Matricom is Android taken to the next level. It has the most powerful features that ensure 100% amazing Android TV experience. The Matricom G-Box Q2 is definitely a value- for- money Android box for your home. It grants you access to all your favorite apps for streaming anything your heart desires. It has the inbuilt storage of 16 GB that allows you to save and download endless means of communication. It has a very fast processor that ensures no buffering and a great time relaxing back at home with friends, family and even alone. The solid structure of this device is very compact but don’t let that fool you because the features it provides are amazing. All the Android TV accessories like HDMI cable, IR remote, and power cord are included in the box. The box also contains a starter guide for the product. There is a great source of connectivity via Bluetooth that gives an extra edge to the gamers out there. Its remote just makes everything easier for the users. It is built on the latest Android platform supporting all the basic features and making it very easy for the users as they are very well familiar with the Android interface. It also supports Kodi application. 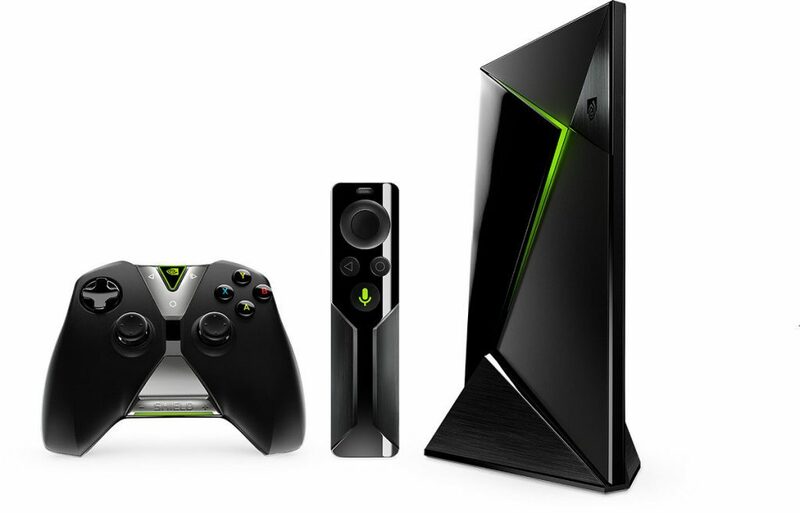 Nvidia Shield TV is one of the strongest players in the Android TV Box category. Well connected with the Google lifestyle, enjoy all the streaming apps and websites, share photos, listen to music online, display your calendars and what not with the amazing Nvidia Shield TV. 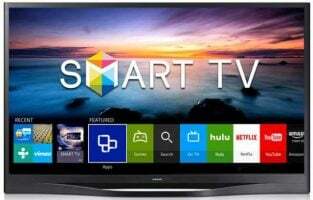 This device has the smoothest 4K HDTV streaming that makes watching your TV shows and movies an amazing experience. The best feature of Nvidia Shield TV is its voice- search capability and the 360-degree viewing service it provides on YouTube. NVIDIA-powered gaming provides you with a very interactive gaming experience. It even enables you to go cordless and enjoy using the Nvidia Shield TV. Moreover, the facility of Google’s revolutionary voice search available on it helps you find your kind of entertainment within no time. It also does the work of price-comparing across all your favorite apps. The Google Assistant service available turns this device into a hands-free, smart device getting you the best viewing experience. When buying an Android TV box, there are several things to consider, such as app compatibility, hardware and purpose. Out of all these, app compatibility is very important to know. Most Android apps such as Netflix, Hulu, PlayStation Vue etc. do function on both types of devices, but not all. Some Android TV boxes come with the popular media center Kodi, but it is always better to get one that has a clean install rather than a preloaded one with pirated add-ons. Sideloading apps might be simple for some, but for others, it can get quite tricky. After you have installed them, you might run into navigation issues in some apps where it becomes a pain just to explore the interface. 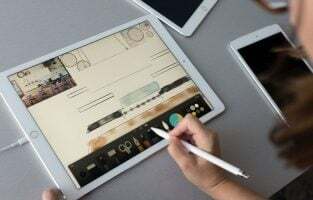 You certainly don’t want your favorite app to be the one that causes complications especially after you have paid a substantial amount for buying the device. Therefore, it’s very important to know which all apps work smoothly with the device you intend to buy. Another important aspect to think about is software upgrades. You need to buy a device that is constantly getting upgrades, making the user experience better and better. You should always buy a device from a well-known company such as Nvidia or Xiamoi to get regular updates. Do the right research and you will be able to get the perfect Android TV box for your needs.